For a product listing, prices and availability click "Q Index" at top right. For more details, especially on the kits (particle size, concentration and volumes) go to the Spherotech website and write our catalogue number without the first letter Q into 'search'. ProSciTech is the sole agent for Spherotech Inc in Australia and New Zealand, but can supply anywhere. Spherotech is an ISO 9001 registered company that produces a large range of micro particles for micro-calibration, standardisation, immune and other reactions. Highly uniform latex particles are available from 0.05 to 18µm in various concentrations and with various coatings or properties, including antigens, ferromagnetic, fluorescent and non-fluorescent colours. This page contains information on Spherotech products, including an outline of product ranges and general information. A near complete listing of Spherotech products is on the linked catalogue number /price page. Note that we prefix Spherotech's catalogue numbers with a 'Q' (previously was 'S'). In addition to listed products, special batches can be prepared quickly and economically - email us for a quotation. Our prices are very similar to American prices, when converted to AU$ and we supply free into store within Australia and to New Zealand; Spherotech orders above AU$300.00 are freight free to any destination. Please refrain from doubling price request to ProSciTech and Spherotech. Delivery is ex our stock for common products and 2 - 4 weeks for others. The lower concentration (0.1%) plain latex spheres for size calibration in electron and light microscopy are featured on page S2. These particle solutions should be refrigerated whenever possible, but never frozen. Spherotech's catalogue numbers are preceded by a "Q" - to fit into our chapter. 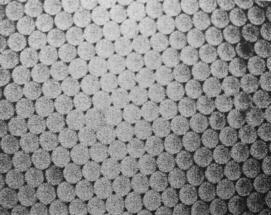 Polystyrene particles are prepared by an emulsion polymerisation process. These particles have been pre-cleaned using either mixed bed ion exchange or by centrifugation. Further cleaning by the user is usually not required. The size of particles is determined by either NICOMP Laser Particle Sizer or visually by Scanning Electron Microscope. We can supply a wide variety of uniform particles, ranging in size from 0.05µm to 15µm, with surface functional groups such as carboxyl or amino groups for covalent coupling of proteins or other ligands. Particles with an antigen coating include a $42 AQIS (quarantine) inspection fee; overseas orders may be shipped direct and we could thus avoid this tax and offer a lower price. Fluorescent particles with single or multiple fluorophores are available in various sizes, emission spectra and combinations suitable for uses in flow cytometry, fluorescence microscopy, phagocytosis studies and cell labelling. Yellow Calibration Particles, in dropper bottle containing a mixture of the same size particles with different fluorescence intensities. Allophycocyanin Calibration Particles, in two dropper bottles. One contains blank particles, the other a mixture of same-size particles, but different fluorescence intensity. For use in allophycocyanin channel. Most usefully, various fluorescent particles with a carboxyl surface are available for covalent coupling. Spherotech manufactures various fluorescent particles coated with antibody or avidin. The Calibration Particles are designed for routine calibration of flow cytometer. The Rainbow Particles contains a mixture of fluorophores that enable the Rainbow Calibration Particles to be excited at any wavelength from 365nm to 650nm which allows the calibration of all channels in the flow cytometer with the same set of particles. The Rainbow Calibration Particles contain a set of several similar size particles with different fluorescence intensities all contained in a convenient dropper bottle. A few drops of the particles from the dropper bottle to 1mL of diluent provide enough particles for flow cytometry. The diluted calibration particles can withstand repeated freezing and thawing. Diluted particle suspension can be stored in the freezer and reused later. This is a cost saving feature unique to Rainbow Calibration Particles. In addition to the cost saving and convenience, the Rainbow Calibration Particles are also very stable under proper storage condition. Allophycocyanin Calibration Particles, in two dropper bottles. One contains blank particles, the other containing a mixture of same size particles with different fluorencence intensity. For use in Allophycocyanin channel. The coloured particles are prepared by polymerising styrene in a solution of oil soluble nonfluorescent. As a result the particles are free of solvent commonly found when the particles are prepared by staining with a solution of dye in organic solvent. Spherotech coloured particles are intensely coloured. The uses include visual detection in latex agglutination assay or chromatographic type detection devises. Rainbow Slides are designed for the alignment and calibration of confocal fluorescent microscope. Rainbow Slides are multiple well glass slides containing several sizes of Rainbow Particles in a range of intensities. Please inquire for the availability. Our ferromagnetic particles are uniform in size and can be reversibly magnetised or demagnetised. They are used to study the mechano-transduction across the cell surface by binding the ferromagnetic particles to the cell surface receptors and for the application of mechanical stresses directly to the cell surface receptors with a magnetic twisting device. The magnetic particles are prepared according to the procedures described in US Patent No. 5,091,206. They are prepared by coating a layer of magnetite and polystyrene onto monodispersed (ie. uniform sized) polystyrene core particles. As a result, the magnetic particles are spherical in shape, and paramagnetic in nature. They are also very uniform in size. The magnetite contents of these magnetic particles can be adjusted but in general it represents about 10% to 15%. The magnetic particles can be easily separated from a suspension magnetically. These particles become non-magnetic when removed from a magnet, and do not retain any detectable magnetism even after repeated exposure to strong magnetic field. The magnetic particles can be used for cell separation, affinity purification, DNA probe assays, magnetic particle EIA, etc. The FlexiMag Separator (Cat. # SFMS-1000) is the only magnetic separator on the market with interchangeable tube holders to fit tube size from 1.5mL microfuge tube to 200mL tissue culture bottle. The separator is supplied with three tube holders, small, medium and large. Two holders can be used on each FlexiMag separator simultaneously. Extra sets of holders can be purchased separately. Each small tube holder holds four 1.5mL microfuge tubes or four 12x75mm test tubes. Each medium tube holder holds two 16x100mm test tubes or two 15mL centrifuge tubes. Two 50mL centrifuge tubes can be placed in the large tube holder. With two small tube holders in place it can accommodate up to eight 1.5mL microfuge tubes, or eight 12x75mm test tubes. With two medium tube holders in place it can accommodate four 15mL centrifuge tubes. With two large tube holders in place it can accommodate four 50mL centrifuge tubes. Without the tube holder in place it can accommodate two 200mL tissue culture bottles. The FlexiMag Separator is ideal for any laboratory working with magnetic particles for cell separation, immunoassay or affinity purification. The FlexiMag Separator offers the unmatched cost saving and flexibility to meet the requirements of a research laboratory which uses only small amounts of magnetic particles as well as the requirement of a manufacturing facility that may need to process large amounts of magnetic particles at a time. The FlexiMag Separator, Jr. (Cat. # SFMJ-1000) is designed specifically for the research lab where only small amounts of magnetic particles are used. 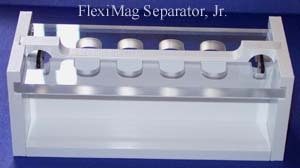 The FlexiMag Separator, Jr. will hold eight each of the microfuge tubes, 5mL cryogenic vials or 12x75mm glass test tubes. The UltraMag Separator System (Cat. # SUMS-4000) is designed to facilitate the washing of magnetic particles in the Magnetic Particles Enzyme Immunoassay (MPEIA) using 96-well plates. The system includes manifold, base, UltraMag separator, waste trap, vacuum pump, tubing and connector. The magnetic pegs of the UltraMag Separator fit in between the wells underneath the 96-well plate and facilitate magnetic particle separation by pulling them to the wall of the well. The fluid is aspirated gently by a specially designed vacuum pump to minimise the particle loss. Particles are released into fresh volume of wash fluid. Repeating the process results in the removal of unbound reactants thus facilitating the washing of the magnetic particles. After incubation and washing, the microtiter plate can be read in an appropriate microtiter plate reader by directly loading the micro plate along with the UltraMag Separator. This assures that the magnetic particles stay out of the path of the light beam, passing through the bottom of the well and corresponding holes in the UltraMag Separator. Magnetic particles offer larger surface area and significantly faster reaction kinetics thus reducing the total time to complete an assay. Microparticles are washed more completely and efficiently, leaving less residual reactants, thus lowering background signal and potentially improving sensitivity. Coating of magnetic particles is easier and gives more uniform solid phase and helps to minimise lot-to-lot variation. US$ prices ex US works. Our prices include freight and exchange rate conversion. For Oz &plus; NZ customers we supply at only fractionally higher cost - ask for a quote. STN-9: Measuring MEF with Flow Cytometer Using SPHERO Rainbow Calibration Particles. Spherotech has several different designs of magnetic separators. These are used for separating both Paramagnetic and Ferromagnetic particles from a suspension. These designs accommodate different size tubes and other receptacles specific to various applications. Magnetic particles offer larger surface area and significantly faster reaction kinetics. As a result, the total time to complete an assay is reduced. Microparticles are washed more efficiently leaving less residual reactants, thus, lowering background signal and potentially improving sensitivity. Coating of magnetic particle is easier, gives a more uniform solid phase and helps to minimize lot-to-lot variation. The SPHERO™ FlexiMag Separator (Cat. No. : QFMS-1000) accommodates tubes ranging from 1.5 mL microfuge tube to 200 mL tissue culture bottle. It uses interchangeable tube holders to secure different size tubes and bottles. The separator comes with a set of three tube holders, Small, Medium and Large. Additional holders can be purchased separately, if needed. The Small holder holds up to four 1.5 mL microfuge or four 10 or 12x75 mm test tubes (8 total). The Large holder can hold two 50 mL centrifuge tubes (4 total). Two 200 mL tissue culture bottles directly without any tube holders. The SPHEROTM FlexiMag Separator is ideal for any laboratory working with magnetic particles for cell separation, immunoassay or affinity purification. It offers the flexibility to meet the small scale requirements of a research laboratory and the large quantity processing of a commercial facility. The SPHERO™ FlexiMag Separator Jr. (Cat. No. QFMJ-1000) is designed for small scale use. It holds up to eight 1.5 mL microfuge tubes, 5 mL cryovials, 10x75 mm or 12x75mm tubes. The SPHERO™ MicroMag Separator (Cat No. QMMS-2000) are designed to fit any 96-well plate with round bottom, flat bottom or V bottom. The magnet will pull the particles to the corner of the well bottom to facilitate the aspiration of supernatant during the washing. The SPHERO™ HandiMag Separator is a 1"x2"x0.375" Neodymium-Iron-Boron high strength magnet with nickel coating . The HandiMag can be used to separate the magnetic particles in various containers such as microfuge tubes, test tubes or centrifuge tubes by holding the magnet against the wall of containers by hand or with a rubber band. The SPHERO™ MiniTube Mag Separator (Cat. No. QMTMS-16) holds up to sixteen 1.5 mL tubes. The SPHERO™ UltraMag Separator (Cat. No. QUMS-3000) and SPHERO™ UltraMag DW Separator (Cat. No. QUMDS-1000) are designed to facilitate the washing of magnetic particles in the Magnetic Particles Enzyme Immunoassay (MPEIA) using 96-well plates. The magnetic pegs of UltraMag Separator fit between the wells underneath the 96-well plate. The microplate is read in an appropriate microtiter plate reader by loading the microplate with the attached UltraMag Separator into the reader. The magnets ensure that the magnetic particles stay out of the light beam passing through the bottom of the well and corresponding holes in the UltraMag Separator. The microplate is read in an appropriate microtiter plate reader by loading the microplate with the attached UltraMag Separator into the reader. The magnets ensure that the magnetic particles stay out of light beam passing through the bottom of the well and corresponding holes in the UltraMag Separator. Magnetic particles offer larger surface area and significantly faster reaction kinetics; thus, reducing the total time to complete an assay.